Do you sometimes have a shiny, oily T-zone with drier cheeks and enlarged pores? Oil Balancing Gel Wash gently lifts away impurities while removing excess oil and caring for your skin. Your skin will feel cleansed, soft and revitalized! 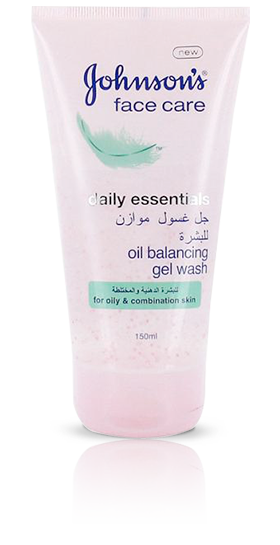 Oil Balancing Gel Wash – for oily skin or combination skin is rated 4.8 out of 5 by 5. Rated 5 out of 5 by nhel from one of the best I choose this because of all the johnsons gel wash I used this is the one that really helps hydrate and make my face fresh especially with its oil balancing formula that leaves my skin soft. I used this as an everyday gel wash especially for us who dont have time to pamper ourselfs because of the heavy work. atleast with this gel wash it makes our face fresh even after our duty hours. Just take it as an every day routine and ill assure you even without having a make up youll feel young and fresh with this gel wash. Mornings and evenings, lather into hands, massage onto face and rinse. Aqua, Glycerin, Sodium Laureth Sulfate, Betaine, Lauryll Glucoside, Acrylates/C10-30 Alkyl Acrylate Crosspolymer, Mannitol, Panthenol, Ascorbyl Glucoside, Magnesium Aspartate, Zinc Gluconate, Copper Gluconate, Hydrogenated Palm Glycerides Citrate, Glyceryl Oleate, Coco-Glucoside, PEG-80 Sorbitan Laurate, Polysorbate 20, Acrylates/Ammonium Methacrylate Copolymer, Hydroxypropyl Methylcellulose, Cellulose, Disodium EDTA, Sodium Hydroxide, Citric Acid, Triethyl Citrate, Sodium Benzoate, Parfum, Cl 73360, Cl77007, Cl77891.